The last of the seven sins of memory shows that being unable to forget is a double-edged sword. Of all Daniel L. Schacter’s seven sins of memory it is the last, persistence, that is the most polarised in its effect (Schacter, 1999). While the persistence of memory can be vital to our survival, at the same time it can leave us haunted by past events we might rather forget. 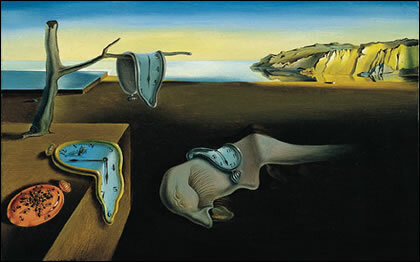 As in surrealist Salvador Dali’s most famous painting, ‘The Persistence of Memory‘, memories can weigh heavily on our minds; thoughts, like ants, scurrying: endlessly searching for who knows what. For those suffering from post-traumatic stress disorder, images and recollections of a traumatic event become an intrusive and sometimes unbearable part of everyday experience. The trauma continues to resurface, again and again, despite attempts at thought management or repression. Of course being able to repress these memories would provide some relief for sufferers, but is it possible? Professor Richard McNally and colleagues from Harvard University wanted to find out whether memories such as these could be effectively repressed by trauma sufferers using a ‘directed forgetting’ procedure: essentially just telling people to forget (McNally et al., 1998). They studied a group of 14 women who had been sexually abused as children and compared them with a control group. Participants in both groups were directly asked either to remember a particular word or to forget it. Some of the words they were asked to remember or forget were related to traumatic memories (e.g. ‘abuse’). What Professor McNally and colleagues found was that control participants were more likely to forget trauma words they were told to forget, while remembering trauma words they were told to remember. It seemed control participants could successfully suppress their memories. The same could not be said of participants who had suffered traumatic experiences. These participants were unable to consciously forget words that were trauma-related. This suggests that people who have experienced a trauma lose conscious cognitive control over aspects of their memory. It seems that the persistence of some memories is too strong for us to consciously control: suppression is not an option. The intrusive persistence of disturbing past episodes may also be particularly important in depression. In fact this persistence can produce a dangerous cycle which may be key to the maintenance of depressive disorders. Ruminating over past events can lead to depression, while depression can then lead straight back in to rumination. It is a vicious circle. There’s evidence for this depressive cycle from studies which show two different aspects of memory’s persistence. Studies have examined the unconscious ways depressed people process their memories. Watkins et al. (1996), for example, compared depressed participants to a control group in how they responded to positive and negative words. The results showed that while the control group tended to be biased towards remembering more positive words, the depressed participants remembered more negative words. This suggests that depressed people are more likely to remember past negative events – the first part of the depressive cycle. The first group were put into a ruminative mood with an exercise which focussed attention internally. They were, for example, asked to recall and think about one of their dreams. The second group turned their attention outwards by, for example, thinking about the shape of clouds in the sky. This was designed as a filler task to help block self-focussed thoughts. Participants were then asked to recall at least eight incidents that had happened to them – anything they liked. The results showed that those participants who had been put in a ruminative mood tended to recall more negative memories than those who’d been engaged in the filler task. This experiment is evidence for the second part of the depressive cycle: that ruminative thinking leads to the recall of more negative memories. This in turn is likely to lead to depression. Taken together these two studies, and others like them, suggest the persistence of memory can play an important role in the maintenance of depression. But that’s enough of depression and trauma. The fact is that, of the seven sins of memory, it is easiest to see the positive, adaptive nature of memory’s persistence. Our very survival relies on the fact that we remember when bad consequences follow from particular situations. Living in a comfortable modern society may mean a person has relatively few real life-threatening dangers to face on a regular basis. But when people are exposed to more precarious environments, making the same mistake twice can be disastrous. Depression and traumatic stress disorders may partly be the regrettable downsides of memory systems that are designed to keep us alive. Lyubomirsky, S., Caldwell, N. D., & Nolen-Hoeksema, S. (1998). Effects of ruminative and distracting responses to depressed mood on retrieval of autobiographical memories, Journal of Personality and Social Psychology, 75(1), 166-177. McNally, R. J., Metzger, L. J., Lasko, N. B., Clancy, S. A., & Pitman, R. K. (1998). Directed forgetting of trauma cues in adult survivors of childhood sexual abuse with and without posttraumatic stress disorder, Journal of abnormal psychology, 107(4), 596-601. Watkins, P. C., Vache, K., Verney, S. P., Muller, S., & Mathews, A. (1996). Unconscious mood-congruent memory bias in depression., Journal of Abnormal Psychology, 105(1), 34-41.